This is my 2 year old lab Noah. He is a 'demo' dog for the organization Canines with a Cause and trained to do all sorts of tasks such as picking up items that fall (dime, wallet, keys, papers, pens...) and bring them to your hand, bring the phone on command, open/close doors, press automatic access buttons, pull socks off, even flush the toilet! Needless to say, asking him to stay still while I took this picture was a piece of cake for him. Hope you gave him a good treat! I must have missed this while voting. This is great...a well trained dog indeed! This image makes me smile...well done! What a great dog! 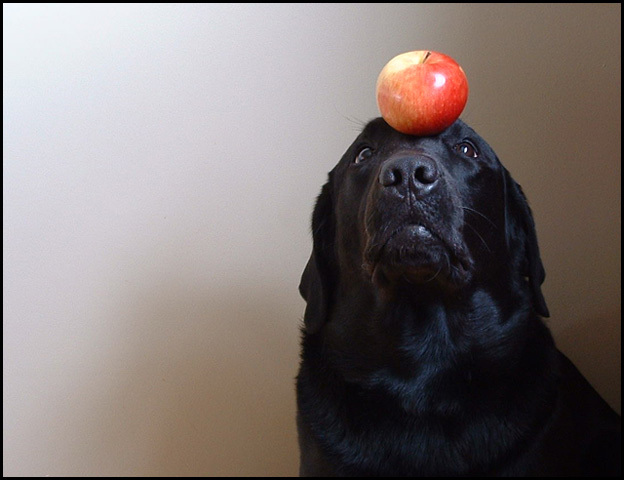 I like his expression and stillness with that apple on his head...good contrast also between his black coat and the apple. Lol, that expression is priceless. I gave it a 7 despite the technical problems in this particular shot as this photo made me smile. Could use a contrast boost though and some more light from beneath to bring out some detail in the dogs fur but good job. i love the humorous facial expression! There is much personality in this shot! Excellent background, lighting, composition, title, AND model !! Neat how you got the dog to stay still like that. What a sweetheart! Great model. He looks like he's focused on it. Good highlights in the eyes, and I know how hard it is to photograph a black dog. Nice background, too,...like how you graduated the color. I just love it. I can't explain why. His expression is great. This is great, my favorite of the whole bunch! Oh, I wish I had taken this! This stands out from the other WIliam Tell shots in a fantastic way. Congrats! Proudly hosted by Sargasso Networks. Current Server Time: 04/24/2019 06:15:34 AM EDT.